Looking for an Academy center channel speaker for my home theater. Prefer oil walnut but open to all available speakers. Live in Central Florida between Tampa and Orlando. Any help would really be appreciated! Selling my black Academy. I was going to refinish it to match my refinished Chorus IIs but I just bought another oak Academy so this one is for sale. I bought it about 10 years ago from a forum member. Cabinet is in great shape. Speakers are all good. I noticed when I took off the grill for the pictures that it appears the previous owner re-glued the dust cap. I guess this is a common issue that is easily fixed. There is no buzzing from the speakers as the result of the dust cap repair. It has served me well for 10 years and sounds great. Selling it for the same price I paid for my oak version. SOLD $325 $300 Would like to sell locally as this is a heavy speaker. Chicago northwest suburbs. *After a bit of consideration I dropped the price for forum members. * I have for sale an Academy speaker in black. I bought a pair from an older lady but I'm only going to use one. If someone really wants the pair though I'm not married to them. They are both in overall great condition. The lady I got them from used them in the vertical configuration so the bottom has some scuffs on it. Not really a big deal to me but it may be the end of the world for someone. I'm asking $225 for the single or $400 for the pair....YES, $400 for a PAIR OF Academys!! If your interested in the pair message me. I live in Central Arkansas and would prefer to meet in the general area but if you want the speaker(s) and need it shipped and you don't mind paying for shipping I can ship it. Its a heavy rascal though, 30lbs or better. The Elmo chair in the background is not for sale, sorry, my chihuahua would kill me. Thanks for looking. 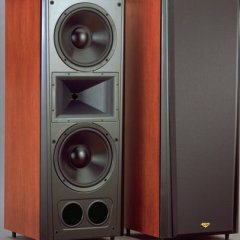 Black Academy speaker for sale. Cabinet could use refinish but otherwise in good condition. Local pickup in Austin, TX. I'm offering up a pair of oak oil Chorus IIs, for pick up in South Orange County. Speakers sound terrific, but have a few cosmetic issues. There are stains on both tops from the previous owner, one looking like maybe it was left by a flower pot, the other much smaller. There are also some scratches on tops, but nothing major. For some reason, the previous owner put 5 pin holes across each front above the grill, which are noticeable up close, but start to blend in from a few feet away. Other than the above, they look pretty good. I used Howard Restor-A-Finish followed by Howard Feed-N-Wax on the cabinets, and the grills, speakers and radiators are in nice shape. One set of binding posts has been changed out, for whatever reason, to gold plated ones, while the other remains the red and black plastic ones that came stock. I opened the modified one up to make sure that the crossover had not been replaced, and it hadn't. The Chorus II binding post cup remains, as well. When I bought them, both speakers had aftermarket tweeter diaphragms, which I replaced with Crites. All other drivers and speakers appeared to be stock. Serial numbers are sequential. I do not have boxes for them. I am asking $500 $475 for them, which I think is more than fair. *SOLD I have a nice walnut Academy as well (see multiple photos below), which I would like $200 $185 for, also available for local pick up only (sorry). *SOLD For possible trade options, see post #20. If you are interested, and would like more photos, I will send via email.